Are Your Teams Really Working Groups? Teams are a critical component of every organization as the predominant vehicle for decision-making and accomplishing tasks. A team is defined as a group of people who need each other to accomplish specific results. Teamwork represents a set of values that encourages listening, responds constructively to views expressed by others, gives others the benefit of the doubt, provides support and recognizes the interests and achievements of others. These values help teams, their individual members, and the entire organization perform. In many organizational environments, working groups and teams are both essentially used in the same way despite there being a measurable difference between the two. 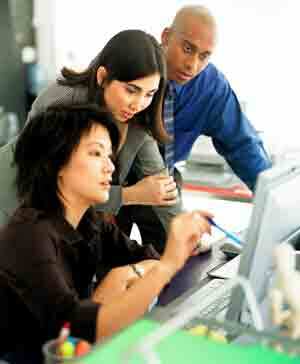 Working groups are simply a loose combination of individuals working toward a common goal. These groups’ structures will vary according to the makeup and personalities of the members. Teams, on the other hand, are governed by a specific team structure that takes into account member roles, responsibilities, rules and boundaries. It is important for leaders to understand the distinctions between groups and teams. Most individuals who work within groups perform as individuals. Teams require a common commitment to which members hold themselves mutually accountable. They are committed to a common purpose and a set of performance goals and approaches. Teams differ fundamentally from working groups because they require both individual and mutual accountability. Teams go beyond group discussion, debate and decision-making and do more than simply share information and best practice performance standards. To understand how teams deliver extra performance, it is important for leaders to distinguish between teams and other forms of working groups. A key distinction between groups and teams is found in performance results. A group’s performance is a function of what its individual members do as individuals: members don’t take responsibility for results other than their own, nor do they attempt to develop incremental performance contributions requiring the combined work of two or more members. A team’s performance includes both individual results and the collective results of the team. The collective results reflect the joint and real contributions of team members. A strong and clearly focused leader typically directs working groups. Due to the nature of the group’s leadership, the individual leader has the ability to influence the work and results the group produces. Teams, on the other hand, develop shared leadership roles that are established by team members. This reduces the influence of a single team member on the results of the team. Working groups focus on a purpose that is the same as the broader organizational mission, whereas teams focus on a specific team purpose for which they are established to address. The team focuses on a specific purpose, and the results are focused to particularly fulfill that established purpose. Teams produce discrete work products through the joint contributions of their members. Possible performance levels are greater than the sum of the individual contributions of its members. Working group performance, however, is simply the product of the results of individual members. Working groups perform their work in efficiently run meetings. Teams encourage open-ended discussions and active problem solving throughout their meetings. The team meeting is specifically structured to encourage these activities. Within this structure, meetings are guided and directed by the roles and responsibilities of team members and are defined by the boundaries and framework established by the team to govern its activities. Working groups measure their effectiveness indirectly by their influence on others. Teams measure performance by directly assessing the collective results of the team and its ability to fulfill its purpose and mission. The results of the team make something specific happen, and that adds real value to the results. By contrast, gathering as a working group from time to time does not sustain the group’s performance. Working groups discuss, decide and delegate the work of the group to individual members or committees. Teams discuss, decide and then complete the real work required together as a team. Within teams, performance goals are compelling; they challenge individuals to commit themselves as a team to make a difference within the organization. Since goals are challenging, the onus is on the team alone to make it happen.